Steve Cahoon, MSW, LCSW, a Patient Advocate at Beebe Medical Center, has been recognized by the Society for Healthcare Consumer Advocacy for his patient advocacy work at both the local and the national level. The Society honored Steve Cahoon by presenting him with the prestigious Ruth Ravich Award during the annual conference this month in St. Louis, MO. Ruth Ravich was the founder and first president of the Society, and was committed to improving healthcare services and communication between patients and their healthcare providers. The Society is affiliated with the American Hospital Association. While the Society was founded in 1971, the role of a patient representative was born in the 1960s to follow up on patient complaints regarding service and delivery of care in healthcare institutions such as hospitals and nursing homes. The role has expanded over the decades to become a key component in quality assessment and improvement of care. Mr. Cahoon has a master’s degree in social work from the University of Maryland and he is a licensed social worker. He joined Beebe Medical Center in 1999 as a discharge planner in Case Management after working as a social worker at Johns Hopkins University Hospital for six years. In 2002, he joined Beebe’s Patient Relations Department as the Patient Advocate. Mr. Cahoon’s focus at Beebe Medical Center is on patient satisfaction and improving the patient experience across the system. 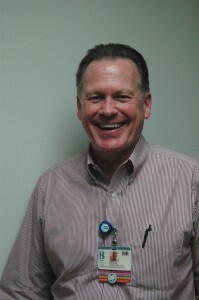 He also has been active in programs to educate staff members on patient satisfaction. Mr. Cahoon also regularly presents information on advance directives to consumer groups in the community. His work has not stopped in Sussex County. Mr. Cahoon also has been actively involved at the national level. He has been a member of the Society for Healthcare Consumer Advocacy since 2004, and has served on the Board for four years. He also chaired the annual conference in 2008 and 2011.